Royal Charlotte Bank, Brazil – Capt. Antonio Amaral – 500 lbs. Brisbane, Australia – Capt. Ken Brown on Megumi – 600 lbs. Bay of Islands, New Zealand – Capt. John Batterton on Hook & Bull – 500 lbs. Kona, HI – Capt. Bobby Cherry on Cherry Pit II – 657 lbs. Kona, HI – Game Plan – 525 lbs. Mauritius – Zazou II – 915 lbs. Guatemala – Guatemala Fishing Tours – 700 lbs. Kona, HI – Hooked Up – 500 lbs. Ascension Island – Capt. Olaf Grimkowski – 750 lbs. Royal Charlotte Bank, Brazil – Capt. Antonio Amaral – 550 lbs. Colombia – Capt. LR Hastings on Southpaw – 700 lbs. Mauritius – Paille En Queue III – 600 lbs. Kona, HI – Hooked Up – 550 lbs. Kona, HI – Capt. Chip Van Mols on Monkey Biz II – 650 lbs. Kona, HI – Topshape – 850 lbs. Kona, Hi – Anxious – 700 lbs. Kona, HI – Makana Lani – 650 lbs. Kona, HI – Lepika – 550 lbs. Kona, HI – Johnny’s Edge – 604 lbs. Aruba – Capt. Butch Cox – 600 lbs. Durban, South Africa – Charlie Brown – 800 lbs. Los Suenos, Costa Rica – Capt. Bill Kieldsen – 800 lbs. Panama – Tropic Star Lodge Boat – 800 lbs. Panama – Tropic Star Lodge Boat – 700 lbs. Dominical, Costa Rica – Capt. Kevin Malone on Ben There – 600 lbs. Capt. LR Hastings with mate Steve Hall and John Tierney on Southpaw, a 57 Spencer, released a 650-700 lb. 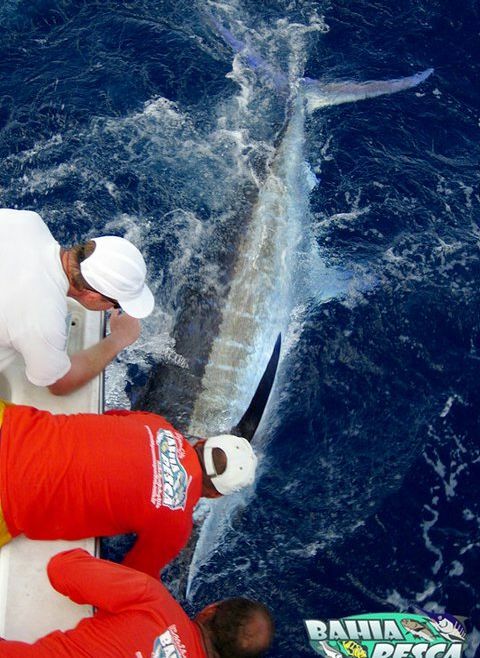 blue marlin on Jan.8th off the coast of Columbia while in route from Aruba to Panama. Thanks John. We will get that up!